The book was shortlisted for the Best First Book in the African Region for the Commonwealth Writers Prize, and is one of the first published by the new Clerkenwell Press headed by Geoff Mulligan, J.M. Coetzee's editor...which reminds me of the comparison I thought of in the end: not just with Coetzee, Atwood, Crace and McCarthy but also Yan Martell. Like Life of Pi it is, most of all, an inspiring allegory. 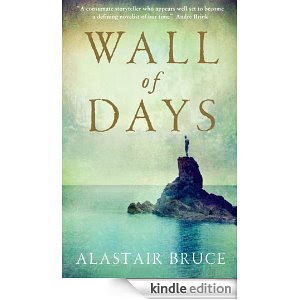 Wall of Days sounds intense and frightening. You mentioned "The Prisoner" which is one of my favorite television series of all time. I'm wondering if you've ever visited Portmeirion, where it was filmed. Yes, it's a great book - it really makes you think! Yes, I have indeed visited Portmeirion - a couple of times, in fact. My husband is a big fan of the Prisoner, and each time we've gone I've always tried to persuade him to buy himself a Prisoner Blazer as a souvenir (which are on sale at the shop there) but he won't. It's a weird place, everything seems out of scale and too exotic - all of it set in a pretty little wooded valley by the sea. It makes the perfect film set, though. Whoever decided to use it was inspired. It was a close-run thing, Paul.